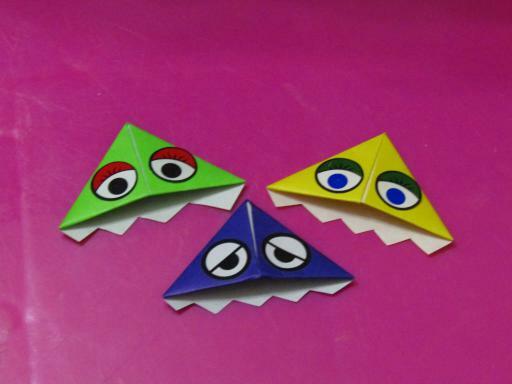 I made these cute little page corners or book marks, I do do some cutting to make the teeth but you can also just make them with patterned paper with no eyes and cutting. 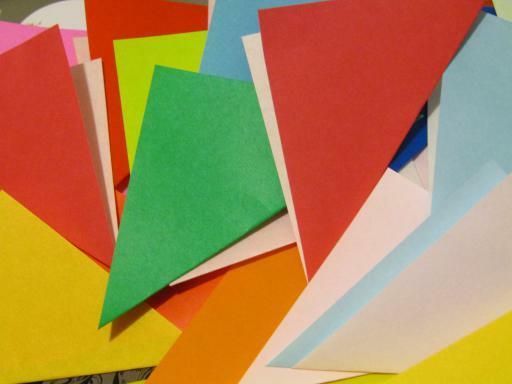 1) Square paper – the size of the square affects the size of the page corner you produce and some papers fold better than others, I used small origami paper. 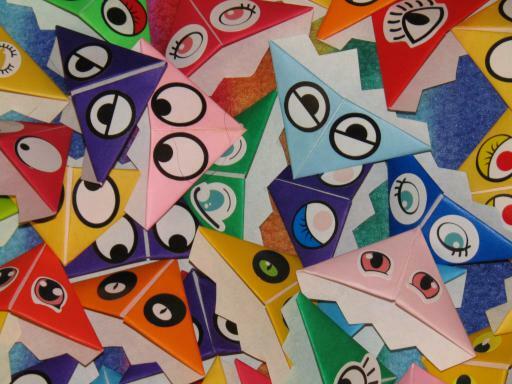 2) Eye stickers – I just bought a roll of these and origami paper often comes with face stickers of various sorts but you could also draw eyes onto the paler coloured papers or draw them on white card/paper and cut and stick them on. With pens be a bit careful as not all will stay nicely on the slightly shiny surface alot of the origami papers have. 4) Colour pens/pencils – optional for drawing your own monster skin textures or messages on the inside. 1) Fold the the square piece of paper along the diagonal so that two corners meet and it forms a triangle. 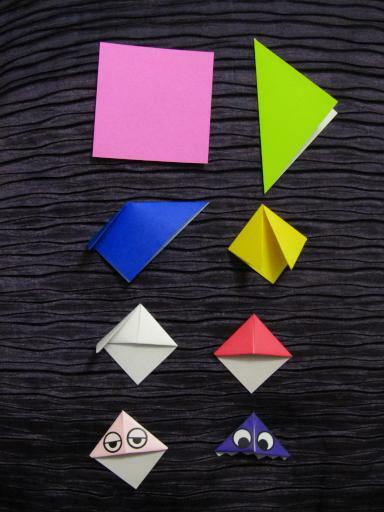 2) On edge of the triangle is where the fold is and the tip of the triangle is like two pieces of paper, fold the two tips along the folded “closed” edge so that the meet at the “open” tip, so that it is now a square or diamond shape depending on which way round you have it. 3) Allow the two little arms/folds you’ve just made to pop up as they wont want to lay flat, underneath is a diamond shaped area, fold the tip of this diamond up so that it meets the original folded edge i.e. the tip/triangle shape between the two “arms”. Make sure you on fold the top piece of paper from the “open” tip. Now the diamond shape should be made out of two triangles one being a flap you’ve just folded. This flap can be either on the outside in between the two arms or you can tuck it inside. Left on the outside it can leave a visible stripe if your paper is different colours or textures on each side. 4) Now fold the two arms in half tucking them up inside the little top triangle of the diamond so they wrap over the fold you’ve just made pinning it in place. You now have a little pouch with a triangle at the front and a diamond at the back. Stop here if you don’t want monsters! 5) Add eyes or other decoration. 6) Using scissor or crimping shears cut most of the single sheet of that sticks out from the triangle with a zigzag edge for the teeth. 7) If you want to hide a message in it then make sure you don’t stick the eyes over the gap in the arm folds and unfold it, write your message and refold. These can also be used as mounts for photos in albums or to create home made frames.